In English, we drop the when talking about things in general, but notice that in French, when talking about things in general or abstractly, you must use le, la, l', or les (the definite article). On n'aime pas la musique classique. We dont like classical music. Elle n'aime pas les bonbons. White wine gives me headaches. So if I want to say: "I like girls" I would have to say "J'aime les filles"???? I can't just say: "J'aime filles"? & cant I use the partitive here ? But is there an explanation for this??? Why do I have to use 'les'? 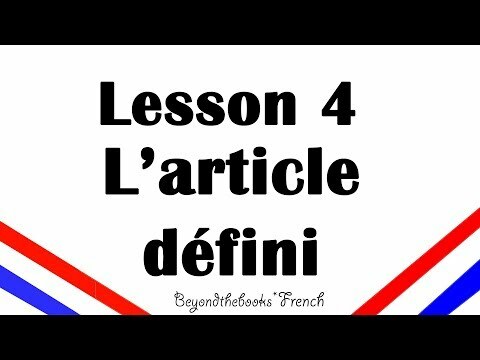 "In English, we drop the when talking about things in general, but notice that in French, when talking about things in general or abstractly, you must use le, la, l', or les (the definite article). " In this case, I refer musique as general thing. Am I correct? I'm sure you've heard this a million times already, but if "il déteste le café" is "he hates coffee" then how does one say "he hates the coffee?" he hates the coffee is "il déteste le café". It is the same in this case.